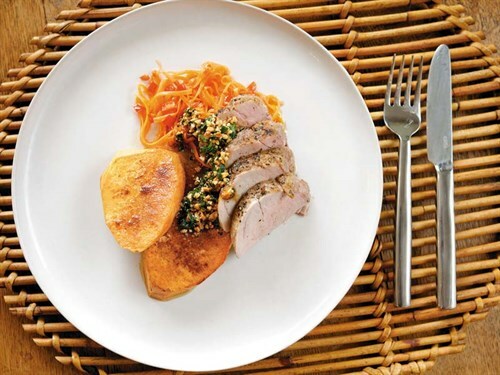 Check out this recipe for pork fillet with kumara, almond dressing, and pickle by Masterchef NZ runners-up Nikki and Jordan Shearer. Heat rice wine vinegar and sugar in a small pot until sugar melts. Once slightly cooled, add the carrot and chilli. Cover and refrigerate until ready to use. Coat both kumara slices and pork fillet in olive oil. Rub the cumin and salt and pepper into the pork. Place on baking paper lined oven tray. Place the kumara rounds on the tray with pork. Sprinkle the cinnamon on one side of the kumara and season with salt. Remove and let pork rest for 4 minutes. For the dressing, mix together oil, vinegar, garlic, honey and paprika. To serve, slice pork and place on plate with pickle, kumara and drizzle with the almond dressing.